Last week Team Tactics had the privilege of holding two corporate hospitality events at the prestigious Lingfield Park racecourse in Surrey. 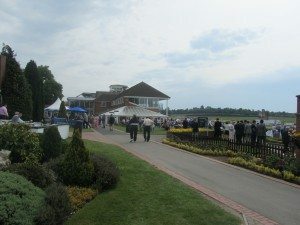 Lingfield is one of the most beautiful racecourses in the UK and also has the distinction of being one of only four all-weather courses in the UK. Furthermore Team Tactics were able to recommend the services of Colin Brown. Colin is a former professional jockey who rode the legendary Desert Orchid many times in his career and is widely regarded as one of the most popular National Hunt jockeys of all time, making him a perfect fit for Lingfield. Colin’s expertise helped many of our clients even come home with some winning’s in their pocket! On the Friday our guests had the use of an exclusive directors box located opposite the finishing line with superb views across the course. Most notably however was the success of Colin Brown’s betting tips. The boss of said construction firm even went home with considerable winnings thanks to the expertise of Mr Brown! Guests also had the privilege of Colin taking groups down to private areas such as the Weighing Room and the Paddock. Saturday Team Tactics welcomed a large wealth management company to Lingfield Park for the Epsom Derby Trials Day. As a thank you to staff past and present the company had 115 guests in a Pavilion Suite. For entertaining larger groups the Pavilion Suite really is fantastic, with extremely modern and high-end furnishings. The staff were extremely attentive and the food was tremendous. Colin Brown was the MC for the day and his professionalism shone through once again with guests commenting how he really added to the event. Overall both events were hugely popular with guests enjoying the beautiful weather at the picturesque Lingfield Park. Colin Brown’s experience provided an extra element to both events ensuring a memorable day out for all involved. At Team Tactics we love to work with our clients in order to provide a bespoke service using our many contacts and years of experience to offer an alternative service guests won’t find elsewhere.